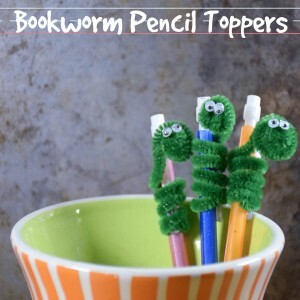 This back to school bookworm pencil topper is so simple to make that anyone can do it! We always make a few of these at the beginning of the school year and give them to our new teachers in a pencil holder. It never hurts to come the first day bearing gifts! It is also an idea for small classmate gifts for birthdays or holidays because they can be made in bulk and are something everyone can use. Don’t forget to make yourself some as well since it is really easy to identify your pencil from a distance! Twirl the pipe cleaner around the top of your pencil – leave about 1/4 of the pipe cleaner straight on top. Wrap the straight end around your finger and then squish it together to make your little worm face. Glue two tiny google eyes to the face of your worm to add cuteness. If you are giving a worm-topper bouquet to a teacher, you can place them in a cute pencil holder or wrap them with a little raffia, ribbon or twine. For classmates, you could alter the color of the bookworm pipe cleaner so that everyone in class doesn’t have the same one. No matter what you choose, it will be a fun way to welcome back-to-school time!